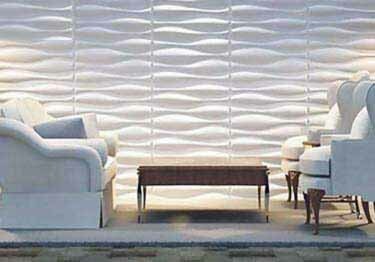 Three Dimensional Stick-On Wall Panels turn any wall into an artistic, visually appealing focal point. Easy to install - just peel and stick! Designed for indoor or outdoor use. Constructed from durable PVC that is made to stand the test of time. Panels are 19.69" x 19.69" each, and are sold in a box of 12. Each box covers approximately 32.30 square feet. Flexible, bendable panels can be cut to size easily with scissors or utility knife. Panels come in matte white and can be painted with any household paint. These waterproof panels are easy to clean with a damp cloth. Great for residential applications like TV wall in family room, bed headboards, staircases, play rooms, and more. Wall panels look great in commercial applications too, including: restaurants, waiting rooms, office spaces, retail settings and more. Panel size: 19.69" x 19.69"
Three Dimensional Stick-On Wall Panels turn any wall into an artistic, visually appealing focal point. Easy to install - just peel and stick! Designed for indoor or outdoor use. Constructed from durable PVC that is made to stand the test of time. Provide the perfect professional flooring / carpet finish. Eight profiles & 39 colors. Comes in 12 ft strips.